BioSigns lets clinicians stay connected to their patients, whether in or out of bed, at home or in transport. Our system continuously measures and displays all vital signs (ECG, pulse, SpO2, blood pressure (cuff-based and now also cuffless on a beat-to-beat basis), respiration rate, skin temperature) with the monitoring accuracy and resolution typically found in ICUs. In addition to the color touchscreen display on the patient-worn device, platforms such as desktop or tablet PCs can be used as remote viewing and notification devices. Our technological specifications ensure a continuous signal and convenient monitoring of data from anywhere in the world. The device communicates via 3G and Wi-Fi for continuous telemonitoring, and USB for configuration and recorded data transfer. The collected data is stored in a PC application or in the cloud, depending on your requirements. BioSigns is able to wirelessly transmit data, leveraging existing hospital Wi-Fi infrastructure, and is designed to provide information output in electronic form (i.e. EMR connectivity) as well as print-outs. And for the patient, it’s convenient and comfortable to wear over the long term, featuring soft body-worn sensors that allow freedom of movement. With BioSigns keeping a watchful eye, physicians and nurses have immediate access to vital patient parameters so they can intervene earlier and respond more rapidly – preventing adverse events and improving patient safety. A lot can happen in four hours. That’s the average time that passes between manual checks of pulse, blood pressure, blood oxygen and temperature, according to current standards of care. Doing these manual spot checks on patients is time-consuming and labor-intensive. And even with all that effort, it can miss a lot. If a patient experiences a health crisis, their temperature can spike or their pulse can drop in an hour or less. And when a clinician spots a change in vital signs after 4 hours, they might not know whether it happened gradually or all at once. There’s no need to miss hours of crucial data. The solution? Continuous monitoring. Using sensors, continuous monitors automatically keep an ongoing record of patient data, meaning staff can check on patient status at any time, get alerts about adverse events, and look over an hour’s, day’s or week’s worth of data to spot any trends. The BioSigns System keeps patients safer: The connection between patient and clinician is never broken, so care is always individualized and timely. Continuous monitoring also contributes to safer, more restful hospital stays. Monitoring with non-invasive sensors eliminates frequent interruptions to check blood pressure and other signs. This cuts down on stress and ends the need to wake up patients. The system is comfortable to wear and does not restrict a patient’s freedom of movement. Increased comfort will likely lead to higher patient satisfaction and quicker healing. Doctors and nurses are only human. Every medical practitioner wants to provide their patients with the best care, but they can’t be everywhere at once. And they can’t predict the medical crises that may keep them from sticking to a strict schedule of vital signs checking. This can make it difficult to check in on patients as often as you’d like—but it doesn’t have to. BioSigns remote monitoring system does the observing for medical teams, so all they need to do is open the app. 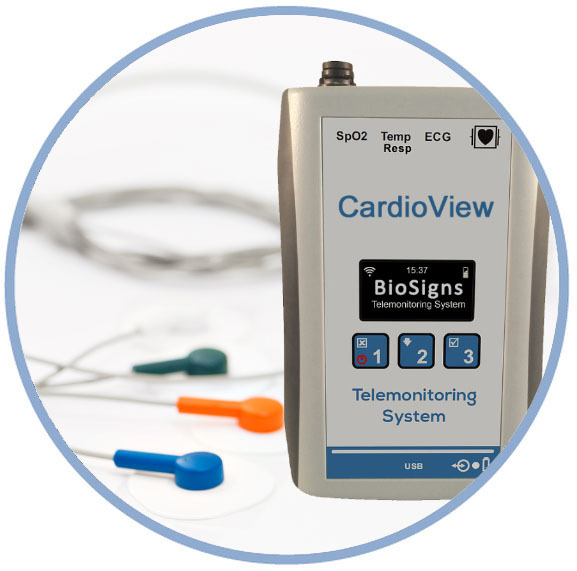 The rugged and reliable BioSigns Monitor is easy to set up and use. It stays with the patient at all times and provides uninterrupted monitoring, across care units and even when the patient is out of bed. Vital signs can also be sent automatically to the electronic medical record at a configurable interval. Doctors and nurses can only be with one patient at a time, but with BioSigns, it’s like they’re in the room with all of them—they get the benefits of frequent checks without the need to walk around a ward or wake up patients. Check patient data from any location, and get alerts if anything goes wrong. Medical professionals don’t have as much time as they wish to talk to patients, explain treatments, and confer with colleagues about each case. Without the need to perform repetitive tasks like taking blood pressure, they could get a lot more done. BioSigns frees up time in the day for medical professionals to do what they do best. Our intuitive system supports individualized clinical decision-making, and gives immediate feedback on the effectiveness of clinical interventions. BioSigns gives clinicians peace of mind and keeps them connected to their patients. Now more than ever, hospitals are under extreme pressure to contain costs without sacrificing quality of care. Providing patients with the best care is an ethical duty, but it’s also essential to comply with guidelines and avoid cost burden from new and upcoming legislative mandates. That means any advance that can improve outcomes without increasing costs is vitally important. Vital signs monitoring is central to high-quality care for patients in the ICU, recovering from surgery or awaiting a diagnosis. It’s often done manually, with caregivers visiting rooms one by one to check blood pressure, pulse and temperature. This takes a long time, but it’s not just that it can be done more cheaply—it can be done better. Automatic continuous monitoring eliminates gaps in data, letting staff check patient health from anywhere and alerting them immediately if something’s wrong. With BioSigns telemonitoring systems, hospitals can cut costs and eliminate the mistakes that come with waiting too long to check vital signs. Our devices also speed up care by freeing up spots in the ICU and other high-volume areas—no more need for patients to stay in a bed just to have their signs monitored. And that’s just the beginning. Future versions of the BioSigns System will allow monitoring patients post-discharge, in order to avoid hospital re-admission. As telemonitoring advances, it will become increasingly central to helping the medical industry provide affordable, high-quality care.